Line voltage monorail that is easy to assemble and customize is engineered for the most demanding residential, and commercial applications. It can be as pre-curved pieces or pieces that may used straight or custom bent in the field to navigate curves and angles for custom designs. No transformer is required. WAC Flexrail1 powers from a standard ceiling junction box. Determine what you want to light. 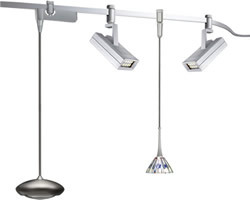 Decide where track heads, pendants or both will be placed to direct light where you want it. Design the Monorail run, connecting the lights. Monorail can be shaped to follow room architecture or create an organic shape. You can sketch out your room on paper. Draw in your lights, then decide how you want to design the track to suspend them. You could use string to lay out your design on the floor to determine your length, especially if you have an especially curvy run. Rail is available in connectable four or eight foot sections to be bent in the field as needed or used as a straight section. A bending machine is available to make smooth and consistent bends. 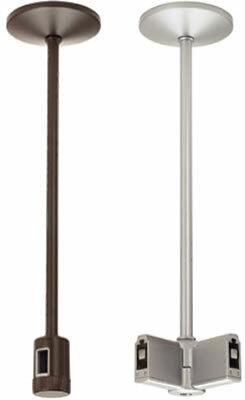 All rail pieces are field-cuttable and bendable up to 24" radius. Connectors allow monorail to make angles up to 270°. Dead-End connectors allow you to switch and dim sections of rail separately. 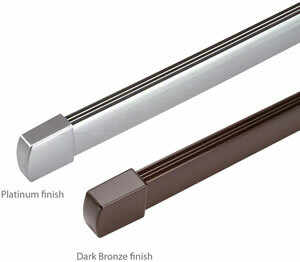 Choose a finish; Dark Bronze or Platinum. Determine how far from the ceiling you would you like your rail to run. 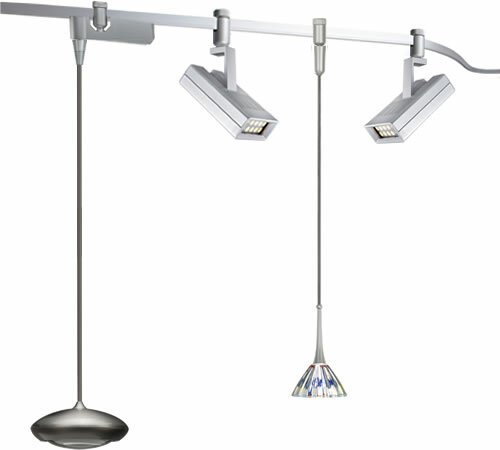 WAC Flexrail 1 Monorail can be installed nearly flush to the ceiling or hang up to 48" or even more using extension rods. Rail can be curved horizontally or vertically, to run up and down. Rigid suspensions mount to flat, sloped or suspended ceilings using standard, sloped ceilings or suspended ceiling brace standoffs. Use 2 supports per 4 foot section and at least 3 per 8 foot section. The total number of supports depends on the shape of the track layout. A rigid stem power feed counts as a support. Systems with very unique shapes or many pendants may require additional supports. Use a Stem Power Feed if anywhere on the rail passes over a junction box. Use a Flexible Power Feed for power on sloped ceilings, custom suspension lengths or if your rail is not placed directly under the junction box. Flexrail 1 is a line voltage system. No transformer is required. Use an isolating connector for systems with a total load of over 2400 watts. Decide where the fixtures should be installed to put light where you want it. 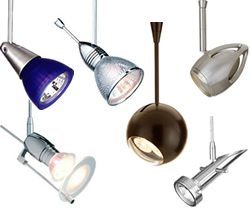 Select from hundreds of low and line voltage pendants and fixtures. Extensions stems can extend fixtures up to 48" from the track. Pendants ship with 6' field cuttable cable. Add optional colorful and decorative accessories and functional optical controls. Flexrail1 Rail Sections HM1-T Offers a slender profile that is easy to assemble and customize, Flexrail1 integrates art and technology into a flexible, line voltage system. 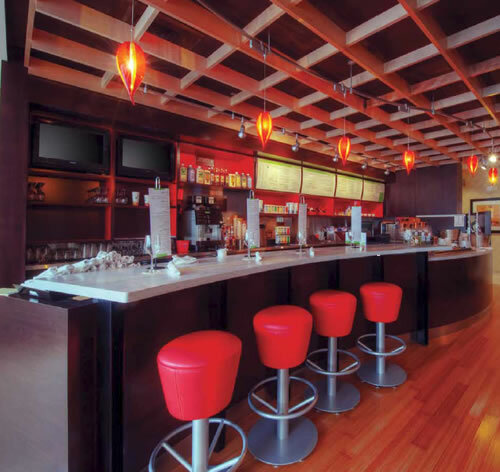 The flexible upgrade to traditional track creates bold, eye-catching three dimensional configurations while challenging ceilings are transformed into dramatic scenes with selections from hundreds of low and line voltage Quick Connect pendants and fixtures. This sturdy, yet distinctive system is engineered for the most demanding residential, and commercial applications where versatility, high performance and robust aesthetics and required. FlexRail may be field cut your exact specifications. Each rail ships with two matching end caps. More end caps are available. Supports rail for flat ceilings and surfaces. Supports rail for sloped ceiling. Accommodates angles up to 45°. Also serves as a support. I Dead-End Connector HM1-IDEC Flexrail1 System Connects two sections of rail with no electrical continuity. Use in conjunction with standoffs and/or cable suspension supports. 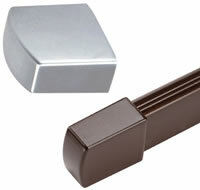 Conceals a T-Bar clip under the canopy for standard 1" T-Bar ceilings. Connects two sections of the track with electrical continuity. Track can be connected at any angle up to 270°. Canopy 3". Used to extend drop of standoffs and connectors. Used to make smooth and consistent bends of rail. Two clamp brackets mount bending machine to table or similar flat surface. 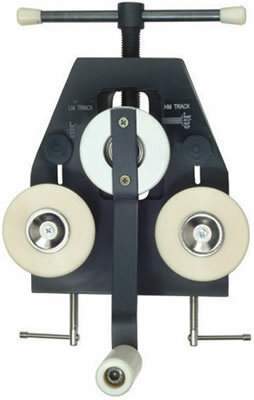 Angle indicators on bending machine help the user determine the proper amount of tension. This same bending machine will bend a variety of monorail. Used for power on sloped ceilings, custom suspension lengths or providing power to rail not placed directly under the junction box supplying 120 volts. Serves as both a support and power feed. May be placed anywhere along the Length of rail. Used for standoffs or "I" connector rods. Connects two standoffs or "I" connector rods together to form a longer drop. Used with standoffs and "I" connectors when mounting HM1 on a slop ceiling. 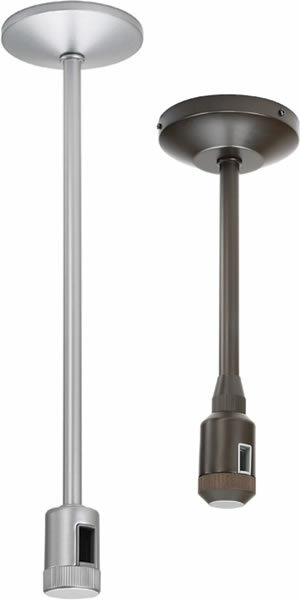 Flexrail1 uses HM1 style low voltage, line voltage, compact fluorescent or metal halide track heads. The HM1-EN50 quick connect transformer adaptor allows any WAC quick connect low voltage track heads and pendants to be used on Flexrail 1. 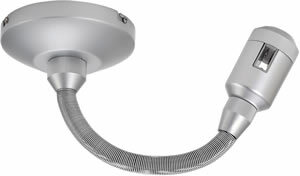 Quick Connect Fixtures are available in LED, Xenon, and MR lamp options. Add an extension stems up to 48" to drop the fixtures and direct light where you want it. 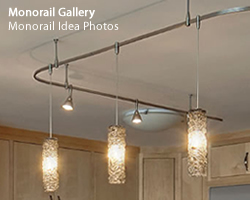 Line Voltage pendants for Flexrail 1.